An oasis in the middle of the prairie landscape of Manitoba, Riding Mountain National Park is a mecca for wildlife, nature, and scenery. As well as being home to numerous species of mammals such as moose, lynx, wolves, coyotes, and elk, the park is also home to American Black Bears, aka Ursus americanus. 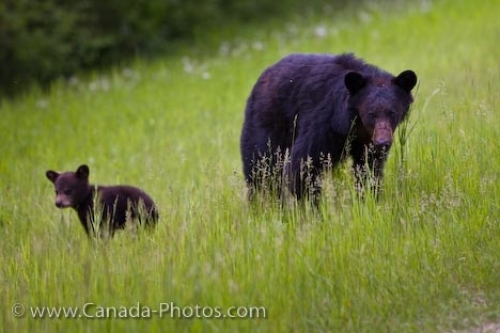 These two American Black Bears, a sow with her cute cub, were happily grazing (the cub playing more than eating) on the lush green grass in Riding Mountain National Park in the heart of Manitoba. A sow will usually give birth to their cub or cubs in January/February (in their den) and by the time they emerge in the spring the cubs which were born hairless, blind and helpless are by then fluffy black balls of inquisitive energy. Picture of an American Black Bear Sow and her cute cub, aka Ursus americanus, in Riding Mountain National Park, Manitoba.